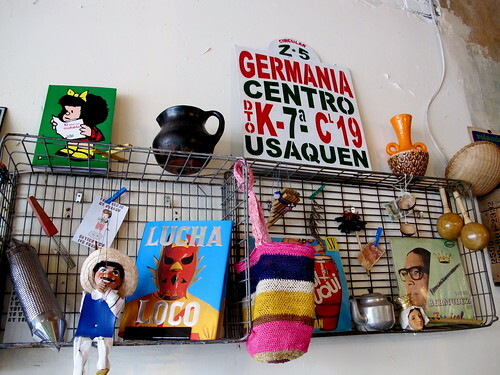 About a month ago I was happily meandering along Gertrude Street in the sunshine, having just bought some Día de los Muertos knick-knacks at the wonderful Amor y Locura. When I realised the cafe I was walking past was Sonido, I decided to continue my day's Latin American theme and pop in for an arepa. 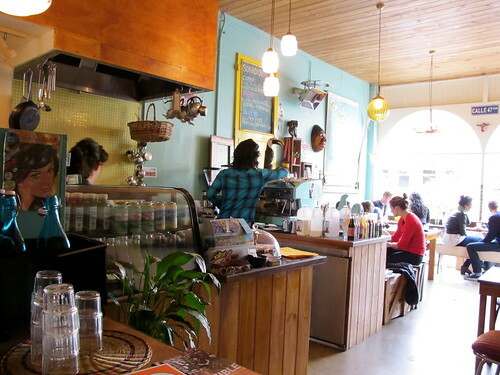 Sonido is a cute-as-a-button daytime cafe located a few doors down from Cutler in one of those shopfronts with the big Play School arched windows. It's been open for about four months. 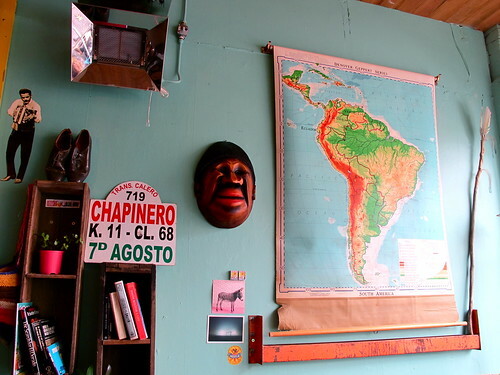 Santiago and Carolina, the young Colombian couple that run it, are both gorgeous and friendly, and I'm completely enamoured with Sonido's casual fitout bedecked with South American posters and trinkets. I've visited THREE times in the last month, taking best-friend-K, The American and Em along for arepa fixes. The good news for the gluten-intolerant is that arepas (flat bread made with corn meal, popular in Colombia and Venezuela) are gluten-free. 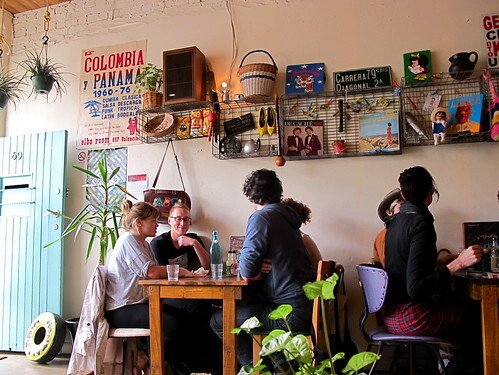 At Sonido they're served with guacamole and a picadillo salsa, with an optional side salad. 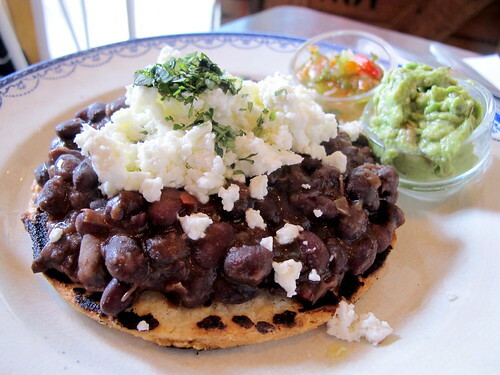 These ones ($11.50) were topped with frijoles and slightly sharp feta. 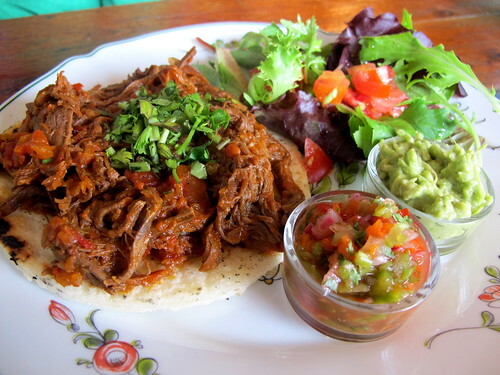 The ropa vieja ("old clothes") arepas are prepared according to a "secret Cuban recipe" ($11.50). Loved these - the shredded beef was nicely seasoned, and the sauce made the lightly crisp arepas go soggy in all the right places. 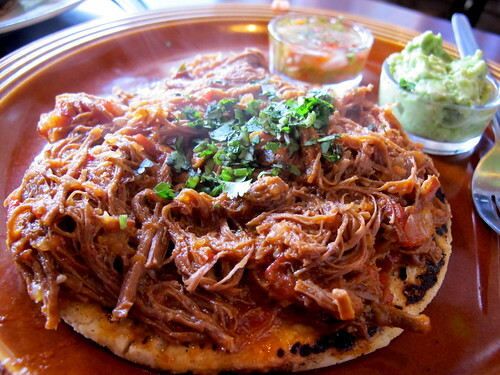 When I went back with Em, she ordered the ropa vieja with side salad (additional $2.50). 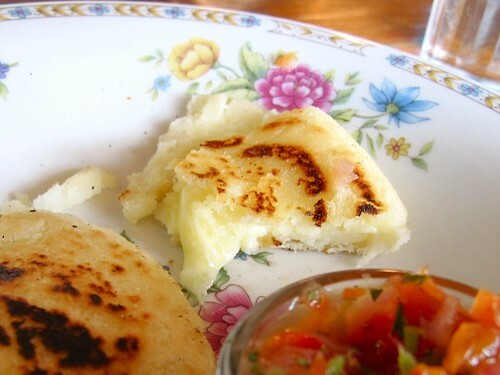 The arepa di choclo ($6, pictured on the right) is the only one that ISN'T gluten-free. 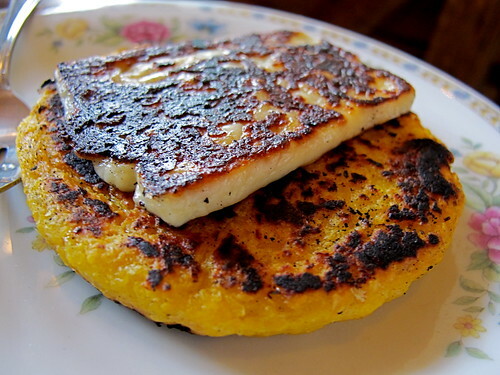 It's a sweet corn arepa (made with "gringo" corn), topped with grilled queso fresco. Little bottles of Amazon habanero chile hot sauce were on standby if you wanted to give your arepa a kick like a mule. 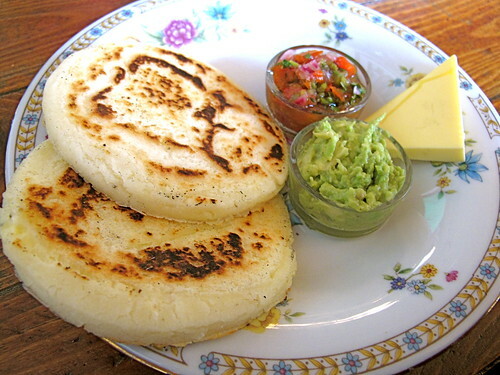 I've also tried the arepas de queso ($8.50). Unlike the others, these one have the queso fresco INSIDE them as a filling. 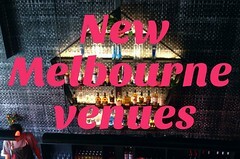 The menu suggests that you "approach these bad boys with a buttered knife in one hand and a salt shaker in the other". Aye aye, sir! Simple but oh so tasty. I attempted a mid-meal photo for you, to show the cheese in cross-section, but I'm afraid it's a little hard to see. As well as the arepas, the small menu offers three kinds of empanadas and a few gluten-free sweets. 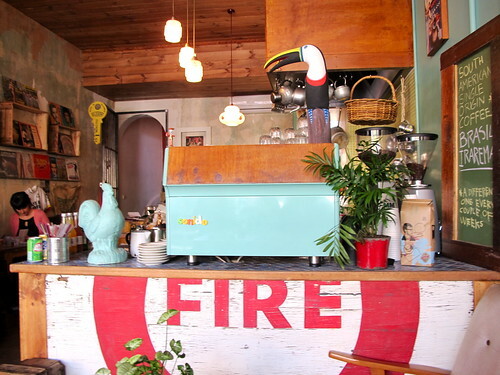 They serve Coffee Supreme's fair trade organic coffee, and a changing South American COE single origin for black coffee orders. 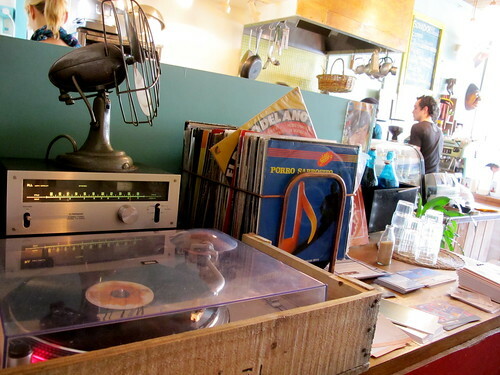 Given that Sonido means "sound" in Spanish, it's no surprise that the turntable has a special place in the cafe. When he's not serving up arepas, Santiago is DJ El Patron. Look out for him and his extensive vintage vinyl collection that he brought from Bogota - he spun records at a great Day of the Dead gig at The Gem that I went to the other week. 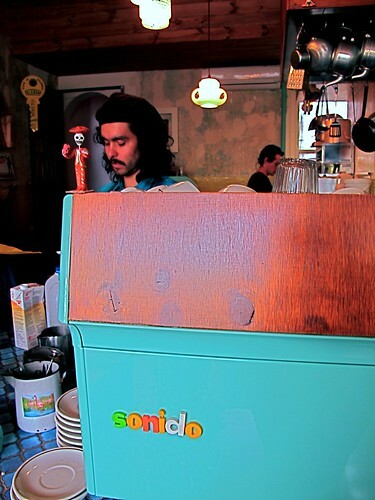 On my most recent visit to Sonido last Sunday, I wanted to try the Chocolate Corona, a traditional Colombian hot chocolate that you can order with cheese. Unfortunately they were out of stock - just another excuse for me to head back there again soon! So glad you like it Claire - it's become my favourite lunch place on the strip. 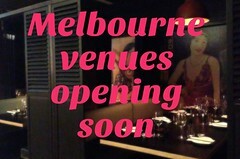 looks very fabulous....the food authentic & delicious....i will have to check it out when next visiting melbourne! This looks fabulous!! I'm hungry already!!! what a cool looking place. Everything looks so delicious as well, I want to eat it all! Che Guevara doing the coffees? Revolutionary. I've walked past it fleetingly, thinking it was just another cafe (soo many in the area). Will be getting there quick smart. I had arapes at Los Latinos the other week. They are so yum. Thanks for the review and info!! Thanks for your kind words, everybody! Hippo #1, I haven't been to Cruzao yet but I intend to next time I'm in the hood.